Original lithograph. A nice impression on wove paper, published in 1938 for the very rare XXe Siecle (issue No. 4). Sheet size 12 1/2 x 9 3/8 inches. Not signed. Condition: there are pinholes from the publisher's original binding along the left edge and creasing near the bottom right corner of the sheet (see second photo). 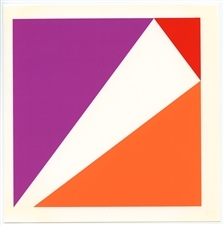 Max Bill serigraph "Three Pythagorean Triangles"
Serigraph (after the study for a painting). Printed in Germany in 1978 and published by Bottrop for a scarce catalogue. The full sheet size is 8 1/4 x 8 1/4 inches (208 x 207 mm). There is printed text on verso, as issued. Not signed. Max Bill serigraph "Four Pythagorean Triangles"
Serigraph (after the study for a painting). Printed in Germany in 1978 and published by Bottrop for a scarce catalogue. The full sheet size is 8 1/4 x 8 1/4 inches (208 x 207 mm). Not signed. Medium: lithograph (after the original Max Bill composition). 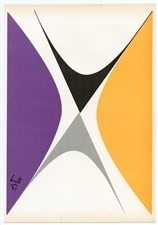 Printed on thin wove paper and published in Stockholm in 1956 for a Swedish survey of Concrete Art. The full sheet measures 10 1/2 x 7 1/4 inches (270 x 185 mm). Signed in the plate, not by hand. Condition: there is some creasing near the bottom left corner of the sheet.